Welcome to Bethville! : Why Don't You Love Bread Like Bread Loves You? Why are the diet "experts" so hard on bread? What did bread ever do to them? All bread has ever wanted to do is sit warm and crusty in its little basket waiting to be dipped in olive oil. It wants you to toast it and slather it with butter. Bread wants to be peanut buttered and jellied. Bread just wants to be loved. Well, good news, bread. I love you. 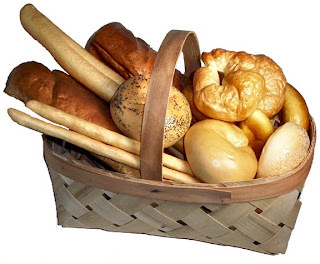 I know that with all the low-carb hype in the news today, it's really hard to just give in and love bread. I know; I spent two years on the Atkins Diet. Having a sandwich became this nefarious act of endulgence. I was only allowed "low-carb" bread that was full of wheat gluten, flaxseed meal, and soy flour. I told myself I was happier not eating bread, that I really did like to eat hamburgers with a knife and fork. Bread just got in the way! Now, I could take this time to go off on how much I hate diets, but I won't. This isn't about diet hate; it's about loving bread. So, all I'm going to say is that you can have a healthy relationship with bread. And the best way to do that is to learn how to bake it. Because, that way, you can control exactly what goes into it. And homemade bread is the best bread there is. Here is a simple and delicious recipe to get you started. 2. Replace it when it expires. 3. Don't overheat the liquid mixture. 4. Yeast eats sugar, so you have to use a real sugar, not a sugar substitute. Before you mix any ingredients, turn on your oven to about 200 degrees. Bread dough needs a nice, warm environment in which to grow, so your kitchen needs to be warm. Mix your flours, salt, and yeast together in a large bowl. Heat your water, oil, and sugar to between 120 and 130 degrees. You can use a baking thermometer OR just dip your (very clean) finger into it. If it burns you, it's too hot. But if you think, "Hmmm, I could take a bath in this," it's just right--I never use a thermometer. Now, I use a bread machine to do all my kneading. If you have one then all you have to do is follow the directions. If not, that's totally fine. Kneading by hand is good for your arm muscles and is quite therapeutic. Slowly add the wet ingredients to the dry mixture. Mix it up as well as you can with a wooden spoon. Then, turn the mixture onto a lightly floured surface, and with very, very, very clean hands, dig in. Kneading of dough is just folding it into itself again and again until the ingredients are completely mixed. This should take about 8 minutes. When the dough is thoroughly kneaded, put it into a larged, greased bowl, cover it, and put it in a warm place to rise. (My mom would always set the bowl on top of the dryer while it was running or in the microwave while it was off. You can also put it on top of the stove, but set it toward the front, away from the oven vent.) Let the dough rise until it doubles in size (usually about an hour). Then, (FUN!) punch the dough down. See? Totally therapeutic. Turn the dough out onto a floured surface and divide it in half. Shape each half into loaves. Put each half in two lightly greased 8x4x2-inch loaf pans. You can use foil pans if you don't own bread pans. Cover and put them back in the warm place and let them rise again. When the dough has nearly doubled in size, bake for 40-45 minutes at 375 degrees. Immediately remove the bread from the pans and let cool on a wire rack or waxed paper surface. Okay, so you tried it, and the dough rose a little bit and then sort of flopped to one side, whimpered, and died. Yep, bread is a big, whiny baby. When this happens, I divide the dough into twelve or so "rolls" and put it on a greased cookie sheet. Give it another 45 minutes to rise and then bake at 375 degrees until the tops are nice and brown. Let these cool and then taste one. Does it taste somewhat like bread? Excellent! Use that bread pudding recipe I gave you in an earlier post. Never waste your bread dough!